Thank you so much to our lovely Monthly Stitch hosts and all of the indie pattern companies, who are offering so many amazing prizes this year. When the dresses challenge was announced, I knew what I was going to make right away. 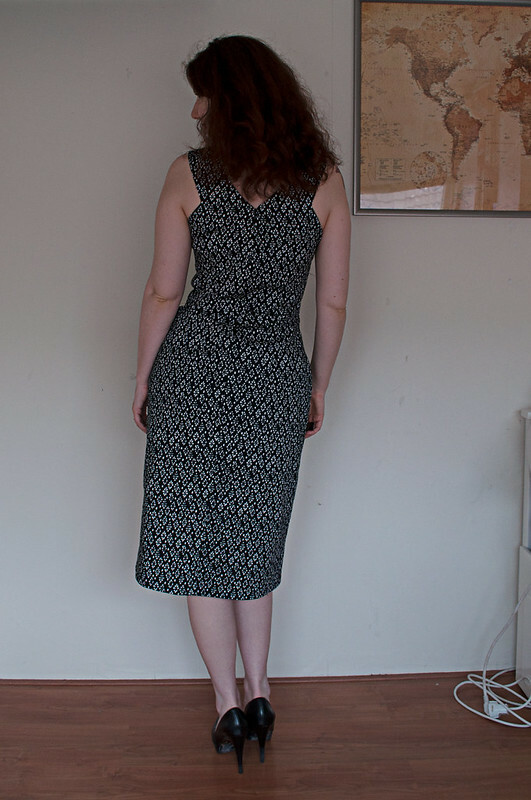 I actually had this dress in the back of my mind when the accessorize challenge came around a few months ago, but since I never got around to cutting it out and sewing it, I figured I should do it now! 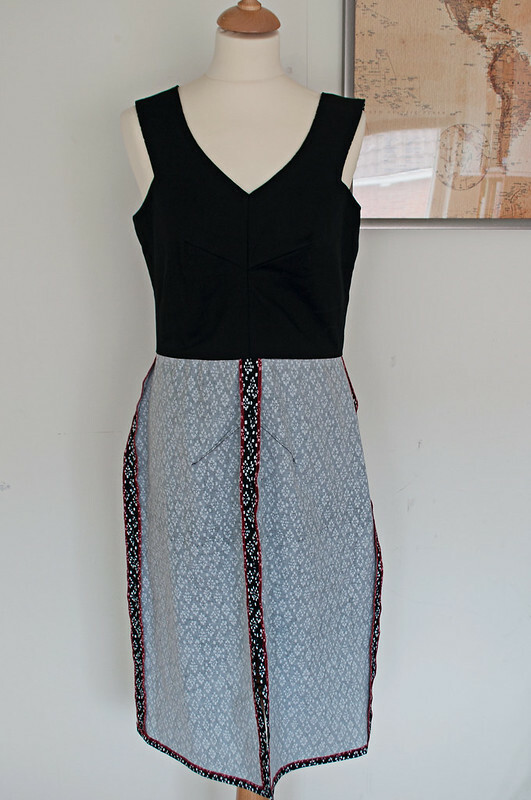 This is the Sophia dress from By Hand London. 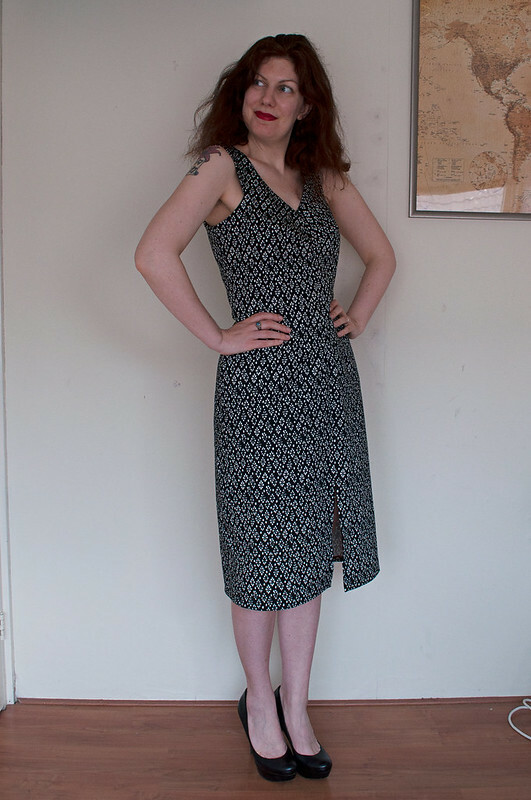 It’s described as “an incredibly versatile party dress featuring a fitted sleeveless V-neck bodice with angled darts and armholes.” I made this dress once before (read all about it here), but I wanted this version to be a little bit more versatile. That one was dark brown and looks to me to be exclusively a party dress, not something you’d likely wear to work. This version I think translates a little better to ‘everyday’ wear, albeit office wear. It’s one of those dresses you can wear to work, then put on a necklace and grab a clutch and you’re ready to go to a cocktail party (note to self: make a clutch). This is a fabric I found at the stoffenspektakel (a bi-annual fabric market in the Netherlands, Belgium, France, and Germany) last year. I found it in a pile of mostly junky, ugly fabrics. I was so happy when I found it. It was only €5 per meter, I believe, so I grabbed 3m, not sure what I was going to do with it. 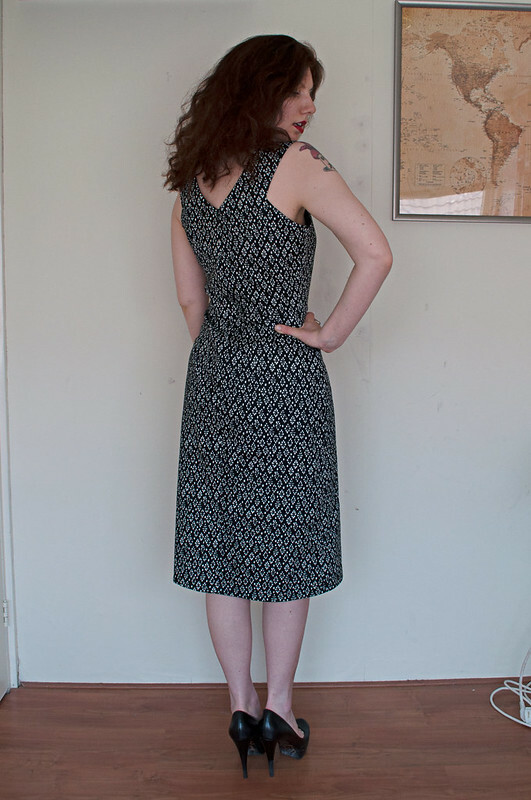 I think it’s a cotton stretch sateen or twill, but I could be wrong as it wasn’t labelled and I’m a little bit out of the game with identifying mystery fabric. The construction went quite well. The instructions are nice and clear, though I wish they had a few more illustrations. Not because the written instructions are bad, but because I like to just glance at the illustrations and sew. It’s faster than reading… What can I say? I’m a lazy seamstress! The only thing is, I ended up sewing together the centre back skirt pieces instead of the centre front, so I had to do a little bit of unpicking. The front and back just look so similar, and the notches on the centre front and back are almost in the same place. Next time, I’ll have to label the pieces. I did make one small change, and that was to sew mitered corners where the slit meets the hem. I also love that the bodice is fully lined, which makes finishing look so nice. I lined the bodice with some black broadcloth I had in my stash. Maybe I could’ve gone with something a bit more luxurious, or something with a print, but I like the simplicity. I saved my little bit of pretty for the skirt. So, the title includes a “tiny bit of red.” That’s because I decided to overlock the seams with red thread instead of black or white. 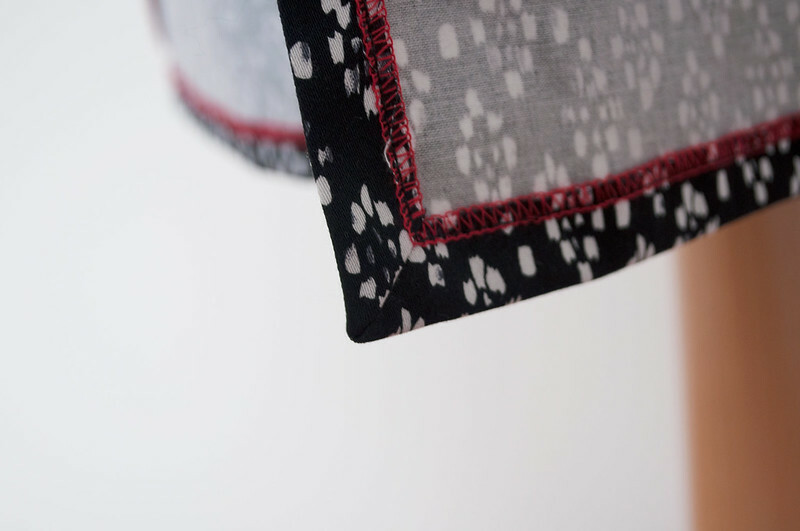 I love to have a little bit of interest on the inside of my garments, whether it be contrasting overlocker thread or pockets with a funky print. That interior touch is fab! Really sets off this styling dress. I love details that only the sewist knows about! What a chic dress! And so beautiful on the inside as well as on the outside!